Welcome to the website where you will learn a lot of new facts that you may have never known before! The Dromaius novaehollandiae, more commonly known as the emu, are found only in the plains of Australia. 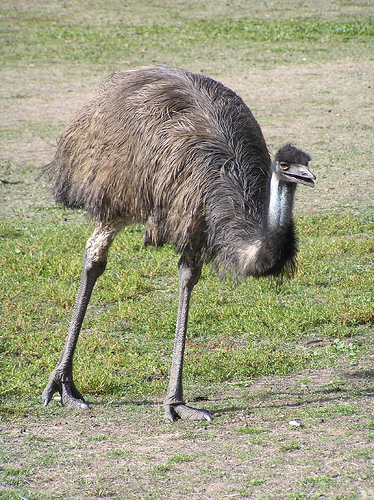 Emus are the second largest bird in the world. It grows to be about 5-6.5 feet tall and weighs about 130 pounds. Male emus are a little smaller than the female emus. Emus can run up to 50 km/h. Emus make loud booming, drumming, and grunting sounds. Emus usually live for 10 to 20 years. Humans use it for many different reasons. One of those reasons is for food. Humans enjoy eating their meat and eggs. For the other reasons, check out Interactions. I've really enjoyed learning about emus. I've always thought they were fascinating birds. I hope that you enjoy looking at my website as mush as I had making it! If you would like to look at more organisms that have been studied at La Crosse, please visit MultipleOrganisms.net! Visit my school's website at www.uwlax.edu.